The impact of the European Community (EC) and EC law on taxation is becoming increasingly important. EC law influences not only national tax law but also tax treaties. 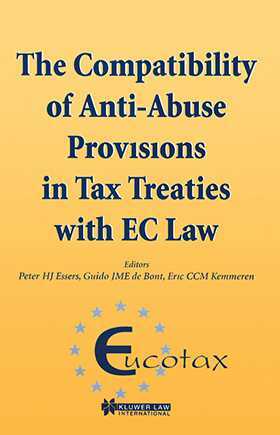 This book focuses on the question of whether anti-abuse provisions in tax treaties conflict with EC law, especially with the fundamental freedoms contained in the EC Treaty. This book deals with this issue from the perspectives of Austria, France, Germany, Italy, the Netherlands, Spain, and the United Kingdom. Though most problems arise with regard to the limitation on benefits clauses contained in the tax treaties concluded between EC member states and the United States, the book also addresses the compatibility with EC law of other anti-abuse clauses and assesses the consequences of a possible conflict. This title is published in association with EUCOTAX (European Universities Cooperating on Taxes), a network of fiscal institutes of several European universities which initiates and coordinates both comparative education and comparative research on taxation. Its projects and programs include winter courses, guest lectures, joint research projects, international conferences, and the exchange of researchers from various countries.